Wear protective gloves, protective clothing, eye protection, face protection. IF INHALED: Remove person to fresh air and keep comfortable for breathing. Call a doctor/physician and seek medical attention for severe exposure or if symptoms persist. Specific treatment, see supplemental first aid instructions in Section 4 (First Aid Measures). IF SWALLOWED: Rinse mouth. Do NOT induce vomiting. Call a poison center/doctor/physician. See supplemental first aid instructions in Section 4 (First Aid Measures). IF ON SKIN (or hair): Take off immediately all contaminated clothing. Rinse skin with water or shower (minimum of 20 minutes). See supplemental first aid instructions in Section 4 (First Aid Measures). IF IN EYES: Immediately call a doctor/physician and seek medical attention. Rinse continuously with water for several minutes (minimum of 20 minutes). Specific treatment, see supplemental first aid instructions in Section 4 (First Aid Measures). Dispose of contents/container in accordance with local, regional, national, international regulations as applicable. See section 13 (Disposal Considerations). SYNONYMS: Ammonium Hydroxide Solutions, Aqua Ammonia, Aqua Ammonia Solutions, Ammonia Solutions, Ammonia Aqueous, Ammonia Water. COMPOSITION: Solutions: Anhydrous Ammonia (10% to 30%); Water (90% to 70%); Density: 16° Baume to 26° Baume. IF INHALED: Immediately remove person to fresh air and keep comfortable for breathing. In case of severe exposure or if irritation persists, breathing difficulties or respiratory symptoms arise, seek medical attention. If not breathing, administer artificial respiration. If trained to do so, administer supplemental oxygen, if required. IF ON SKIN (or hair): Immediately take off all contaminated clothing. Flush skin with copious amounts of tepid water for a minimum of 20 minutes. Do not rub or apply topical, occlusive compounds, such as ointments, certain creams, etc., on affected area. For severe exposure or if irritation persists, seek medical attention. Wash contaminated clothing before reuse. IF IN EYES: Immediately rinse continuously with copious amounts of tepid water for a minimum of 20 minutes. Eyelids should be held apart and away from eyeball for thorough rinsing. Seek medical attention. IF SWALLOWED: Rinse mouth. Do not induce vomiting. If conscious, give large amounts of water to drink. May drink orange juice, citrus juice or diluted vinegar (1:4) to counteract ammonia. If unconscious, do not give anything by mouth. Seek medical attention. Respiratory injury may appear as a delayed phenomenon. Pulmonary edema may follow chemical bronchitis. Supportive treatment with necessary ventilation actions, including oxygen, may warrant consideration. Water Spray, Water Fog, for escaping ammonia gas. Must wear protective clothing and a positive pressure SCBA. Stop flow of liquid if possible. Use water spray to keep fire-exposed containers cool. If a portable container (such as a drum, Intermediate Bulk Container [IBC] or trailer) can be moved from the fire area without risk to the individual, do so to prevent the pressure relief valve from discharging or the container from failing. Stay upwind when containers are threatened. When heated, product will give off ammonia vapor, which is a strong irritant to the eye, skin and respiratory tract. Outdoors, ammonia is not generally a fire hazard. Indoors, in confined areas, ammonia vapors may be a fire hazard, especially if oil or other combustible materials are present. Combustion may form toxic nitrogen oxides (NOx). Only properly trained and equipped persons should respond to an ammonium hydroxide release. Wear eye, hand and respiratory protection and protective clothing; see Section 8, Exposure Controls / Personal Protection. Stop source of leak if possible, provided it can be done in a safe manner. Leave the area of a spill by moving laterally and upwind. Isolate the affected area. Non-responders should evacuate the area, or shelter in place. For a hazardous material release response, Level A and/or Level B ensemble including positive-pressure SCBA should be used. A positive pressure SCBA is required for entry into ammonia atmospheres at or above 300 ppm (IDLH). Stay upwind and use water spray downwind of container to absorb the evolved gas. Contain spill and runoff from entering drains, sewers, streams, lakes and water systems by utilizing methods such as diking, containment, and absorption. Only trained persons should handle ammonium hydroxide. Store in cool, dry and well-ventilated areas, with containers tightly closed. Keep out of direct sunlight and away from heat sources. Do not use any non-ferrous metals such as copper, brass, bronze, aluminum, tin, zinc or galvanized metals. 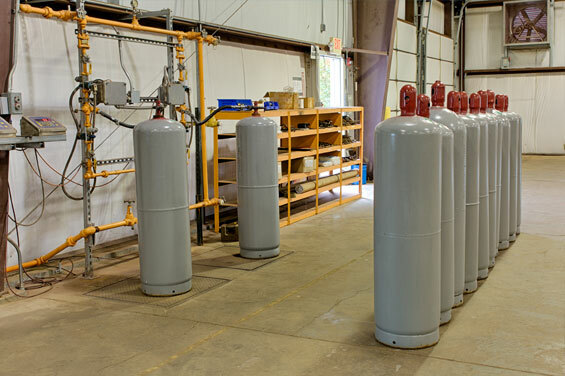 Closed storage tanks should be provided with safety relief values and vacuum breakers as necessary. Local exhaust should be sufficient to keep ammonia vapor below applicable exposure standards. Protective equipment should be stored near, but outside of ammonium hydroxide area. Water for first aid, such as an eyewash station and safety shower, should be kept available in the immediate vicinity. EYE/FACE PROTECTION: Chemical splash goggles should be worn when handling ammonium hydroxide (aqua ammonia). A face shield can be worn over chemical splash goggles as additional protection. Do not wear contact lenses when handling ammonium hydroxide. Refer to 29 CFR 1910.133 for OSHA eye protection requirements. SKIN PROTECTION: Ammonia impervious gloves and clothing (such as neoprene, butyl and Teflon) should be worn to prevent contact during normal operations, such as loading/unloading, transfers, and handling small spills. Chemical boots can be worn as additional protection. RESPIRATORY PROTECTION: Respiratory protection approved by NIOSH for ammonia must be used when applicable safety and health exposure limits are exceeded. For escape in emergencies, NIOSH approved respiratory protection should be used, such as a full-face gas mask and canisters/cartridges approved for ammonia or SCBA. A positive pressure SCBA is required for entry into ammonia atmospheres at or above 300 ppm (IDLH). Refer to 29 CFR 1910.134 and ANSI: Z88.2 for OSHA respiratory protection requirements. VENTILATION: Local exhaust should be sufficient to keep ammonia vapor below applicable exposure standards. FOR A HAZARDOUS MATERIAL RELEASE RESPONSE: Level A and/or Level B ensemble including positive-pressure SCBA should be used. A positive pressure SCBA is required for entry into ammonia atmospheres at or above 300 ppm (IDLH). Colorless liquid or gas with a pungent odor. LEL/UEL 16% to 25% (listed in the NIOSH Pocket Guide to Chemical Hazards 15% to 28%). 1,204 °F (If catalyzed). 1,570 °F (If un-catalyzed). Avoid ammonium hydroxide contact with chemicals such as mercury, chlorine, iodine, bromine, silver oxide or hypochlorites; they can form explosive compounds. Ammonia reacts with strong oxidizers, acids, halogens (including chlorine bleach), and salts of silver, zinc, copper, and other heavy metals. Stable under normal ambient conditions of temperature and pressure. Ammonium hydroxide will reach exothermically with acids. Ammonia vapors are released when heated. Avoid ammonium hydroxide contact with chlorine, which forms a chloramine gas, which is a primary skin irritant and sensitizer. Ammonium hydroxide has a corrosive reaction with galvanized surfaces, copper, brass, bronze, aluminum alloys, mercury, gold and silver. Ammonia will be liberated if heated. Hydrogen will be released on heating ammonia above 450 °C (842 °F). Potential health effects: Ammonia is an irritant and corrosive to the skin, eyes, respiratory tract and mucous membranes. May cause severe chemical burns to the eyes, lungs and skin. Skin and respiratory related diseases could be aggravated by exposure. The extent of injury produced by exposure to ammonia depends on the duration of the exposure, the concentration of the liquid or vapor and the depth of inhalation. Exposure Routes: Inhalation (vapors), skin and/or eye contact (vapors, liquid), ingestion (liquid). Inhalation: Acute exposure to vapor may result in severe irritation of the respiratory tract. May cause dyspnea (breathing difficulty), wheezing, chest pain, bronchospasm, pink frothy sputum, pulmonary edema or respiratory arrest. Respiratory injury may appear as a delayed phenomenon. Pulmonary edema may follow chemical bronchitis. Vapors may cause irritation. Effects of direct contact may range from irritation and lacrimation (tearing) to severe corrosive injury and blindness. Skin: Irritation, corrosive burns, blister formation (vesiculation) may result. Contact with liquid may produce caustic burns. May cause corrosion to the mouth, throat, esophagus and stomach with perforation and peritonitis. Extreme exposure may result in death from spasm, inflammation or edema. Chronic Exposure: Repeated exposure to ammonia may cause chronic irritation of the eyes and respiratory tract. LC50 - 5131 mg/m3 (7338 ppm) to 11,592 mg/m3 (16,600 ppm), 60 minute exposure, Rat. LD50 - 350 mg / kg (Oral / Rat). Not listed in the National Toxicology Program (NTP). Not recognized by OSHA as a carcinogen. Not listed as a carcinogen by the International Agency for Research on Cancer (IARC monograph). Germ cell mutagenicity information is not available. Reproductive toxicity information is not available. Ammonia is harmful to aquatic life at very low concentrations. Notify local health and wildlife officials and operators of any nearby water intakes upon contamination of surface water. Terrestrial plants: LOEC = 3-250 ppm NH3. Aquatic plants: LOEC = 0.5-500 mg NH3-N/L. Acute toxicity to invertebrates: 48 h LC50 = 2.94 mg un-ionized NH3-N/L. Chronic toxicity to invertebrates: NOEC = 0.163-0.42 mg un-ionized NH3/L. Acute toxicity to fish: 96-h: LC50 = 0.09-3.51 mg un-ionized NH3/L. Chronic toxicity to fish: NOEC = 0.025-1.2 mg un-ionized NH3/L. Environmental Fate Information: Ammonia dissipates relatively quickly in ambient air and rapidly returns to the soil via combination with sulfate ions or washout by rainfall. Ammonia strongly adsorbs to soil, sediment particles and colloids in water under aerobic conditions. Biodegradation of ammonia to nitrate occurs in water under aerobic conditions resulting in a biological oxygen demand (BOD). Biodegradable in soil. Ozonation in the air. Soluble in water. Dispose of unused contents/container in accordance with local/regional/national/ international regulations as applicable. Listed as hazardous substance under the Clean Water Act (CWA) (40 CFR 116.4 and 40 CFR 117.3). Classified as hazardous waste under the Resource Conservation and Recovery Act (RCRA) (40 CFR 261.22 Corrosive #D002) if disposed of in original form. Suitably diluted product may be utilized as fertilizer on agricultural land. For hazardous waste regulations information call the RCRA Hotline (800) 424-9346, or visit the US EPA website. Refer to 49 CFR 172.302, General marking requirements for bulk packagings. Refer to 49 CFR 172.301, General marking requirements for non-bulk packagings. Refer to 49 CFR 172.328, Cargo Tanks for additional marking requirements. Marine Pollutant Requirements: Subject to the requirements of 49 CFR 172.322. The material is subject to the reporting requirements of Section 304, Section 312 and Section 313, Title III of the Superfund Amendments and Reauthorization Act (SARA) of 1986 and 40 CFR 372. Under Section 313, as of June 30, 1995, this material is reportable with the following qualifications: 10% of total aqueous ammonia is reportable as Ammonia (CAS #: 7664-41-7) under this listing. Under the Comprehensive Environmental Response, Compensation, and Liability Act of 1980 (CERCLA), Section 103, any environmental release of this chemical equal to or over the reportable quantity of 1,000 pounds (as NH4OH) must be reported promptly to the National Response Center,Washington, D.C. (1-800-424-8802). Toxic Substances Control Act (TSCA): This material and its components are listed in the TSCA Inventory. Clean Air Act - Section 112(r): Material is listed under EPA's Risk Management Program (RMP), 40 CFR Part 68 at concentrations greater than 20% and storage/process amounts greater than the Threshold Quantity (TQ) of 20,000 pounds of contained ammonia (CAS #: 7664-41-7). The chemical is listed under Department of Homeland Security regulation 6 CFR Part 27, Chemical Facility Anti-Terrorism Standards at storage / process amounts greater than the threshold quantity of 20,000 pounds (ammonia concentration 20% or greater). OSHA (Occupational Safety & Health Administration): This material is considered to be hazardous as defined by the OSHA Hazard Communication Standard 29 CFR 1910.1200. This material is subject to Process Safety Management requirements of 29 CFR 1910.119 if maintained on-site, including storage and process, in quantities of 15,000 pounds or greater (>44% ammonia by weight). Replaces all previously dated versions. Section 14.1: Updated information for Package Markings and added "Additional Information." Section 14.2: Updated "Additional Information" and "Environomental Hazards." The American Coatings Association's (ACA) Hazardous Materials Identification System (HMIS®) and corresponding HMIS® Implementation Manual, aid employers with the development and implementation of a comprehensive Hazard Communication Program. The program and manual address hazard assessment, labeling, Safety Data Sheets (SDS), and employee training. ACA's HMIS® hazard rating scheme is designed to be compatible with workplace labeling requirements of the U.S. Occupational Safety and Health Administration's (OSHA) revised Hazard Communication Standard (HCS). It is constructed to communicate hazard information to employees through training and the use of colors, numbers, letters of the alphabet, and symbols of types of personnel protective equipment (PPE). HMIS ratings are to be used with a fully implemented HMIS® program. It is the responsibility of the employer to determine the appropriate hazard classification and personnel protective equipment (PPE) code for this material. For more information on HMIS® consult the HMIS® Implementation Manual. HMIS® is a registered trademark and service mark of the American Coatings Association, Inc. The information, data, and recommendations in this safety data sheet relate only to the specific material designated herein and do not relate to use in combination with any other material or in any process. To the best of our knowledge, the information, data, and recommendations set forth herein are believed to be accurate. We make no warranties, either expressed or implied, with respect thereto and assume no liability in connection with any use of such information, data, and recommendations. Judgements as to the suitability of the information contained herein for the party's own use or purposes are solely the responsibility of that party. Any party handling, transferring, transporting, storing, applying or otherwise using this product should review thoroughly all applicable laws, rules, regulations, standards and good engineering practices. Such thorough review should occur before the party handles, transfers, transports, stores, applies or otherwise uses this product. ° 2016 Tanner Industries, Inc. All Rights Reserved. Notice: We believe the information contained here to be accurate and reliable; however, Tanner Industries, Inc. assumes no liability or responsibility in connection with the information or suggestions herein contained. Moreover, it should not be assumed that every acceptable test or safety procedure or method, precaution, equipment or device is contained within, or that abnormal or unusual circumstances may not warrant or suggest further requirements or additional procedures. The information contained here should not be confused with federal, state, municipal, or insurance requirements, or with national safety or building codes, and no representations or warranties are made with respect thereto. LEGAL NOTICE: Copyright © 1996 - 2016 Tanner Industries, Inc. ("TII"). This website and its content are provided for use by customers and prospective customers of TII only. This website and its content may not be modified, distributed, or reproduced in any form, or by any electronic or mechanical means, including the use of information storage and retrieval systems, or exploited for commercial purposes, without permission in writing from TII. All rights reserved. Unauthorized use is strictly prohibited.